Imagine for a moment that you buy a brand new, beautiful shiny red sports car that looks great and is one which you can even drive at speeds over 200 MPH; only to find out a few days later that the engine is defective and the manufacturer has recalled the vehicle to have it replaced. Bad analogies aside, it's a cautionary tale that sometimes things aren't as good as they always seem — and it perfectly describes the current situation that the New Orleans Saints find themselves in at the moment, with regard to the "hype" surrounding the recent signing of undrafted free agent rookie quarterback Joe Thomas "JT" Barrett. Barrett has a sizable portion of Saints fans excited over his potential to become a part of the organization's future at the QB position, as the team continues to add depth behind starter Drew Brees and perhaps even begins to look for his eventual (and inevitable) replacement. In his time as the starter at the tradition-rich Ohio State University, Barrett single-handedly re-wrote both the school and Big Ten conference record books; while also becoming the first 3-time captain in the program’s history, the Big Ten leader in total yardage (12,697), touchdown passes (104), and all purpose touchdowns (147). Ironically: the Big Ten Conference records that Barrett broke were previously held by Drew Brees himself, when he played at Purdue University from 1997 to 2000. Among his Buckeyes records, Barrett tallied the most wins ever for a quarterback (38), passing yardage (9,434), and rushing yards by a quarterback (3,263). However, Barrett went undrafted largely due to the fact that he struggles with accuracy, has had some past difficulties with his reads and progressions, as well as "ball placement" and "throwing receivers open" (click HERE to watch the detailed analysis by well-respected NFL scouting service Inside The Pylon) — all of which are notable traits of QB play at the professional level that he will most definitely will have to improve upon, if he hopes to be successful and make it onto an NFL roster. Anticipation/Touch/Ball Placement (particularly beyond 15-20 yards) all big issues not sure time will fix, but can hope. Love the leadership capabilities. I'm not a big fan of him under pressure, but I think he can work his way to being a reliable backup in the league. But his top-notch athleticism and a stronger-than-average arm allow him to remain an exciting prospect for the future; and the possible opportunity for Barrett to come to New Orleans and learn how to play the position at the professional level while sitting behind the likely future NFL Hall of Famer in Brees, has led to some overly-excited Saints fans practically "dancing in the streets", thanks mostly to all of the hype that surrounded his signing. The 23-year old Barrett — a native of Wichita Falls, Texas near the Texas-Oklahoma state border — wasn't highly sought after by most NFL teams despite his remarkable accomplishments with the storied Buckeyes program; and drew some rather sharp and biting criticism from several national media analysts who exclusively cover the NFL Draft every year. “J.T. Barrett is a hard one for me because I love the kid,” NFL Network analyst Mike Mayock said earlier this year during a conference call to reporters prior to the start of the 2018 NFL Scouting Combine back in late February. "I see him as an ideal back-up or 3rd quarterback who can play in the league for a lot of years,” Mayock added. In that very same conference call, ESPN NFL Draft "guru" Mel Kiper, Jr. was not as polite as Mayock was, with his own personal assessment. Regardless of whether or not you're a fan of Kiper's analysis: he was spot-on with his view of where Barrett would eventually end up, by the time that the Draft had reached its eventual conclusion. But despite all of the criticism, Barrett is motivated and driven to succeed and is determined to prove all of his doubters wrong, which speaks directly to the many 'intangibles' that he possesses, qualities that include a very high "field IQ" and the ability to be a take-charge leader among his teammates. Some of those very same intangibles were what impressed Saints head coach Sean Payton following Barrett's performance during the team's recent Rookie Mini-Camp 2 weeks ago. Payton told reporters that Barrett was “worthy” of being drafted this year, and as a former quarterback himself, noted what qualities in an NFL QB that he PERSONALLY looks for. Evaluating what Barrett can or can't do at this point will be an on-going process beginning with this week's OTA's at the team's Practice Facility in Metairie, and will undoubtedly will be further scrutinized once the team gets to Training Camp in late July and then plays their Pre-Season slate of 4 games in the month of August. It's a process that overwhelmed the former 2015 College Football Playoff National Championship-winning QB at first, but one that he quickly grew comfortable with as Rookie Mini-Camp came to an end. It's important to note that along with helping the Buckeyes win the National Championship in 2015, Barrett also still managed to complete over 61 percent of his passes in each of his four seasons at Columbus, while posting a VERY IMPRESSIVE 104-to-30 touchdown to interception ratio. So the idea or notion that he's destined to be a career back-up / "clip-board holder", might be somewhat unfair. It's one of the reasons why one recent comparison that was recently thrown out on Social Media with regard to Barrett, even referenced another undrafted African-American QB who eventually went on to achieve unparalleled success at the NFL level after he was deemed to be nothing more than a "career back-up": NFL Hall of Fame legend Warren Moon. Despite his collegiate success at the University of Washington, Moon went unselected in the then-12 round 1978 NFL Draft. With no takers in the NFL, he turned to the Canadian Football League. Moon signed with the Edmonton Eskimos, where he helped lead the Eskimos to a record five consecutive Grey Cup victories (the NFL equivalent of the Super Bowl) in 1978, 1979, 1980, 1981, and 1982. Eventually, Moon's notable success in the CFL led him to gain the undivided attention of the NFL, and he signed with the then-Houston Oilers (now known as the Tennessee Titans) in 1984. Moon would go on to be selected to 9 Pro Bowls and played for 4 different NFL teams (the Oilers, Vikings, Seahawks, and Chiefs), and was inducted into the Pro Football Hall of Fame in 2006. In his entire 23 year professional career as a QB in both the CFL and the NFL combined, Moon threw 5,357 completions in 9,205 attempts for 70,553 yards and 435 touchdowns. Even if his Canadian Football League statistics are discounted, Moon's NFL career numbers were still exceptional: 3,988 completions for 49,325 yards, 291 touchdown passes, 1,736 yards rushing, and 22 rushing touchdowns. Is that to suggest that Barrett is "the next Warren Moon"? But the comparison is valid if we're taking about players who went undrafted and that were overlooked or tremendously undervalued, as Barrett could possibly be. Moon was never thought to be a player that would succeed as a professional player, and obviously went on to prove all of his doubters wrong. But that doesn't mean that Barrett will achieve any similar success. That's where the "caution" comes in for those Saints fans who have gotten themselves all "hyped up" over Barrett's signing by the organization, and the possibility that he could even become the "QB of the future" once Brees retires. Keep in mind: there's NO BETTER PLACE that Barrett could have gone as an undrafted rookie free agent, than with the Saints and Sean Payton and Drew Brees, to help guide and mentor him; and to learn the "ins and outs" of playing the QB position in the NFL. Yes, JT Barrett is potentially an exciting prospect for the future of the Saints franchise. 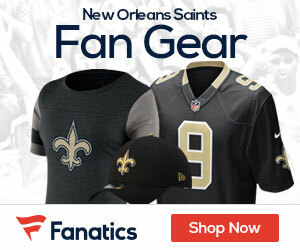 HOLDING OUT FOR A HERO: Can Saints Rookie Quarterback JT Barrett’s Pre-Season Performance Earn Him a Final Roster Spot? STAR-MAKER: Can Saints D-Line Coach Ryan Nielsen “Mold” Marcus Davenport into an Elite NFL Pass-Rusher?